When I started my Etsy store in 2013 nearly everything I made was polymer clay based. Having two children under 4 at the time I was fighting a constant battle to keep little hands out of my equipment. Things were packed into plastic tubs and crammed away to keep them safe. But the more I put away the more I avoided working on new items because everything was scattered around the house. We have a closet off of our family room that (I'm assuming) is supposed to be for coats and cleaning equipment. I say cleaning equipment because there is a power outlet inside (?!?). 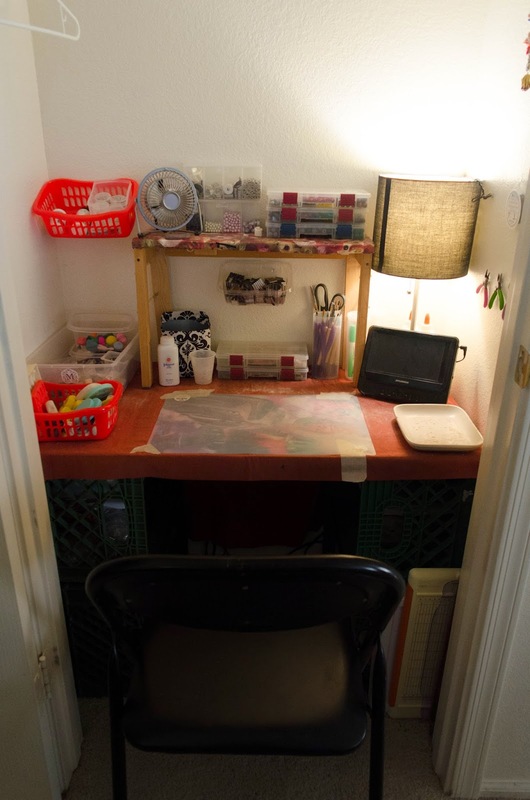 One day it occurred to me that it would be PERFECT for a mini studio. Being that we live in Arizona there were only a handful of coats in it anyway and a few odds and ends like shoes and board games. I set to work cleaning out everything and finding new homes for all of the items. 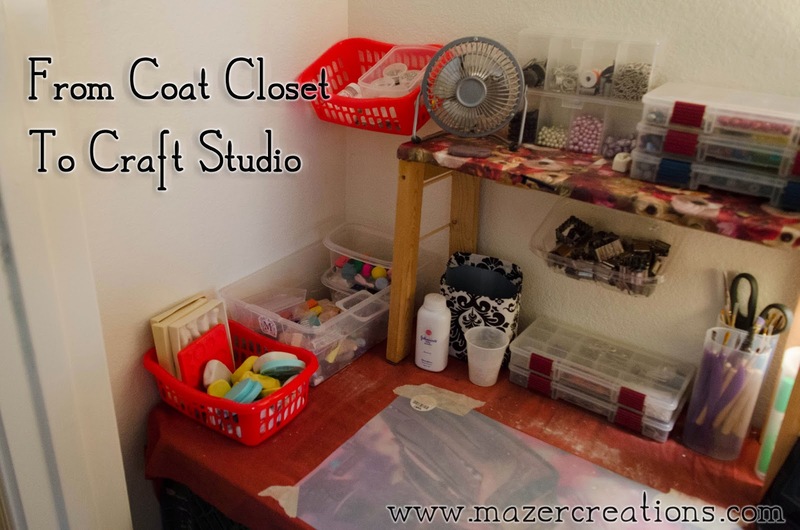 Coats went into our respective closets and board games above the linen closet in the hallway. I vacuumed the space and brought out my trusty tape measure. I used four milk crates (two on each side) to hold up a large piece of plywood that we had sitting in the garage. This plywood was nearly EXACTLY the size I needed. Obviously it was fate. 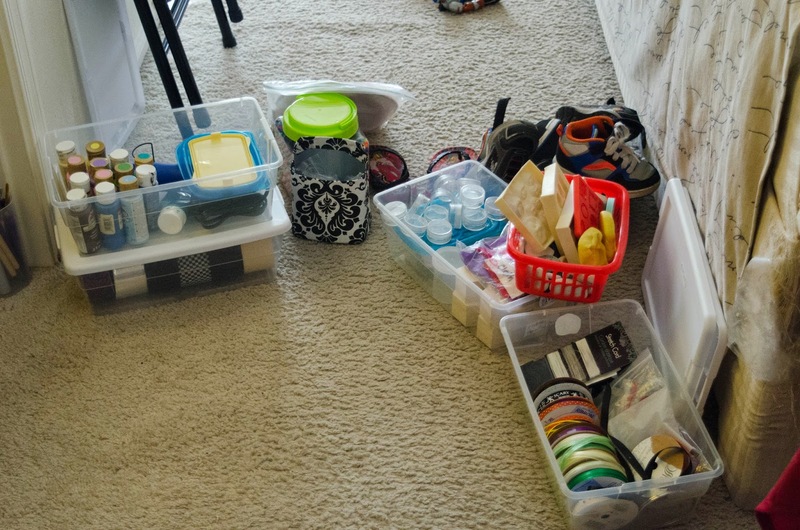 I positioned the milk crates so that they opened to the center, giving me four shelves on which to store plastic bins full of supplies like the ones in the picture above. I covered the plywood with a large piece of scrap material and taped a smooth placemat down in the front to use as a clay mat. I added a small table lamp (with a daylight bulb so I could see the colors as true as possible). I found a tiny fan at the store (Walmart I think) and added it to the space to both keep the air circulating and to provide a space to dry glaze and other materials. I also added a portable DVD player so I could binge watch The Golden Girls while I worked. A few push pins in the wall hold all of my jewelry making pliers and accessories as well as spools of jewelry wire and beading elastic. The most often used items are on the work surface in bins and cups. 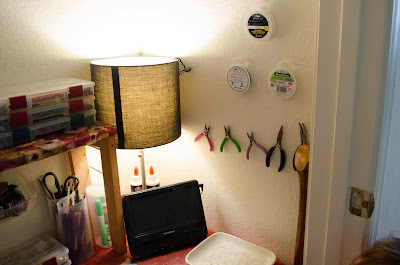 The stacked boxes on the shelf I bought in the fishing department and were designed to hold fish hooks and other angler-centric items but they work great to hold beads and jewelry findings. I added a folding chair with a padded seat (I spend a lot of time in that chair, it had to offer some comfort) that is easily folded up and stored in the closet when not in use. On the outside of the door I have one of those plastic childproof doorknob covers so the kids can't get in there and play. I still have plenty of space and now I don't have to worry about anything happening to my stuff when I'm not working. I can leave a project partially finished and not worry about the kids smashing it or finding them playing Ghostbusters with my sculpting tools.